In SWEEP’s judgment, too much of this funding will go to highway projects, and Senate Bill 1 shortchanges funding for local governments. But state lawmakers also demonstrated a new-found understanding that Colorado can’t just build new highway lanes if it wants to solve its transportation challenges. The state clearly needs to get serious about expanding public transit, encouraging options such as ride-sharing, and making communities more appealing to bicyclists and pedestrians. For 2018-19, SB 1 allocates an additional $495 million to transportation from the state’s budget, and another $150 million in 2019-20. It then refers a measure to the voters in 2019 to issue up to $2.4 billion in bonds, which will be repaid over 20 years by a combination of existing transportation revenues and an additional transfer of $50 million per year from the state general fund. The bill contains a number of important steps forward for multimodal transportation. First and most important, SB 1 creates a new multimodal transportation fund, and allocates 15 percent of the new revenue and bond proceeds to this fund, or a total of $456 million to the multimodal fund. The multimodal fund can be used for public transit, transportation demand-management programs, bicycle and pedestrian infrastructure and programs, and for new technological innovations such as shared electric vehicles. 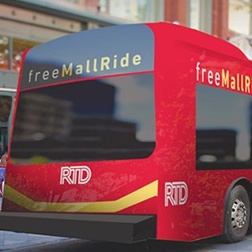 Eighty-five percent of the funds will be distributed as grants to local government or transit agencies, while 15 percent will go to state projects like Bustang (a bus service that is heavily used by Front Range and mountain commuters). In addition, the new transportation law requires that state or local agencies match these funds dollar for dollar, which should create more than $900 million in total investment in multimodal transportation. SWEEP advocated for the creation of the multimodal fund and helped draft the language. Second, $97 million is allocated directly to local governments. These funds are completely flexible, so they can be used for roads, public transit, bike paths, sidewalks, or other community transportation priorities. These dollars can also be used as a match for the new multimodal fund. Third, the bill removes an existing restriction that forbids local governments from using more than 15 percent of their share of state gas tax revenues for operating local public transit. By ending that prohibition, the legislature gave communities much more flexibility to support bus or rail systems. This change completes an effort that SWEEP began in 2013, when we drafted SB 13-048. That law removed most restrictions on local government investment regarding transit, but five years ago SWEEP couldn’t convince lawmakers to end the restriction on transit operations. The rest of the money under the new SB 1 will go the Colorado Department of Transportation (CDOT), which will develop a list of projects before the 2019 bond election. This project list could contain road projects that serve broader transportation purposes. For example, Colorado already has tagged several road corridors as possible places to expand Bus Rapid Transit, such as State Highways 119 and 7; U.S. 287 in the Denver-Boulder corridor; and Colfax Avenue/ U.S. 40, which runs from Lakewood east through Denver and Aurora. Advocates for a balanced, multimodal transportation system should remain actively involved when CDOT begins serious study of how to spend SB1’s new funds. Getting to this point was a tough slog. Two legislators really stand out for their hard work, by insisting that public transit and bicycle and pedestrian infrastructure had to be part of the package: Speaker of the House Crisanta Duran and Representative Faith Winter, who chairs the House Transportation and Energy Committee. Passage of SB 1, however, is just a start on meeting Colorado’s multimodal transportation funding needs. CDOT has identified approximately $5 billion dollars in capital needs for public transit. In 2016, SWEEP and the Colorado Public Interest Research Group conducted a study that found a $1 billion-per-year need in additional funding for public transit (both capital construction and on-going operations), sidewalks, bicycle infrastructure, and safe intersections. And most of these needs are on local streets. To fix this gap, a broad coalition of local governments, business groups, civic organizations, and conservation advocates came together to develop a series of proposed ballot measures for a tax increase on the November 2018 ballot. The proposed measures allocate 45 percent of the funding to CDOT, 40 percent as flexible funds to local governments, and 15 percent to the multimodal fund. The coalition will decide which ballot measure they should move forward, then begin circulating petitions in May. If voters approve a measure, they will enable billions of dollars of additional multimodal investment in the coming years. And they will spend less time sitting alone in their cars, stewing in traffic, and breathing bad air. Will Toor serves as the Director of the Transportation Program at the Southwest Energy Efficiency Project. He previously was a Boulder County Commissioner; Mayor of Boulder, Colorado; and chairman of the Denver Regional Council of Governments. He played a strong role in the development of the Boulder community transit network, EcoPass unlimited access transit pass, ClimateSmart Loan program and EnergySmart program.